As a ministry of First Baptist Church, the Child Development Center's mission is to provide the very best care for one of God’s greatest gifts… your child. The staff at First Baptist Child Development Center is committed to providing a loving, nurturing atmosphere for children ages 6 weeks through age 3. It is our goal to create a positive learning environment for the social, emotional, spiritual, and physical development of your child. The child must be between the ages of 6 weeks through 3 years of age. Children must be 3 by September 1. A non-refundable Registration Fee of $50.00 is due at the time of enrollment. Our registration fee is an annual fee and is due each August. Enrollment and Emergency Authorization Forms, along with a current copy of Health Form #3231, is required at the time of enrollment. Tuition rates remain the same during holidays, center closings, or the absence of your child. The curriculum is based on the Georgia Early Learning & Development Standards for Babies through Threes. These standards are implemented through the Funshine Express Curriculum and through supplemental, compatible, age-appropriate materials. Infants are provided with an interactive, loving environment along with individual care. Our goal with infants is to develop individual relationships between child and teacher in order for them to feel safe, secure and able to flourish. 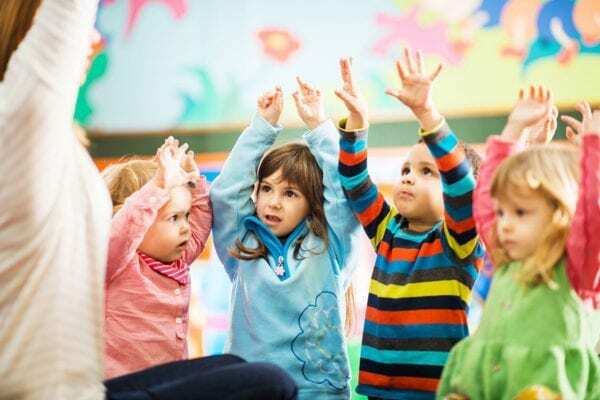 Toddlers are provided with a wide range of hands-on, interactive activities that allow children to use their unique learning styles to experiment and explore their surroundings. The activities in each monthly study stimulates creativity, builds a positive self-image in each child and addresses the need of the whole child. Twos and Threes are provided with a monthly study centered around three themes. Your child is introduced to daily activities which will enchance growth and school readiness for early learners. All the activities take into account the developmental readiness of each child to help boost their self-confidence and independent thinking. This type of environment promotes skills and discipline, inspires creativity, encourages flexibility and provides for emotional and social growth. What a privilege we have to teach your preschooler about God and His wonderful love! Each Bible story is taught daily in a preschool friendly manner to help the children understand what God's Word means for them and how it relates to their lives. Our monthly curriculum is divided into four weekly lessons and begins each month with an inspirational introduction to prepare children for the Bible story. Each month your child will be introduced to one age-appropriate Bible verse and will be reviewed in each lesson in a different manner to help instill the verse into their hearts and minds. Each lesson concludes with a prayer. We feel closing each day with prayer teaches preschoolers different ways we may talk to God. We also offer a Parent Letter to inform parents about the Bible stories their children are learning. Songs and additional activities are included to help reinforce the Bible story at home.